Today was Disney Water Park day! Since we were in Orlando during the off season as it were, Blizzard Beach was closed for annual maintenance, so Typhoon Lagoon it was for us today. When it comes to going to water parks, we try and get there as early as we can, find a spot to set up camp for the day, and then go off and do our thing. Which is pretty much chilling on the lazy river, chilling on the beach, or leaping over the huge waves in the surf pool! I’ve written more in depth about Typhoon Lagoon here, so please do read up on that if you’ve never been before, as this trip report is running behind, and I’m steaming through them as quickly as I can! That means they are not as informative as previous ones, just full of pictures really! You can see all of today’s photographs on my Flickr here. Walt Disney World does a lot of things very well, and one of my favourite things is the themeing that goes into every inch of the place. 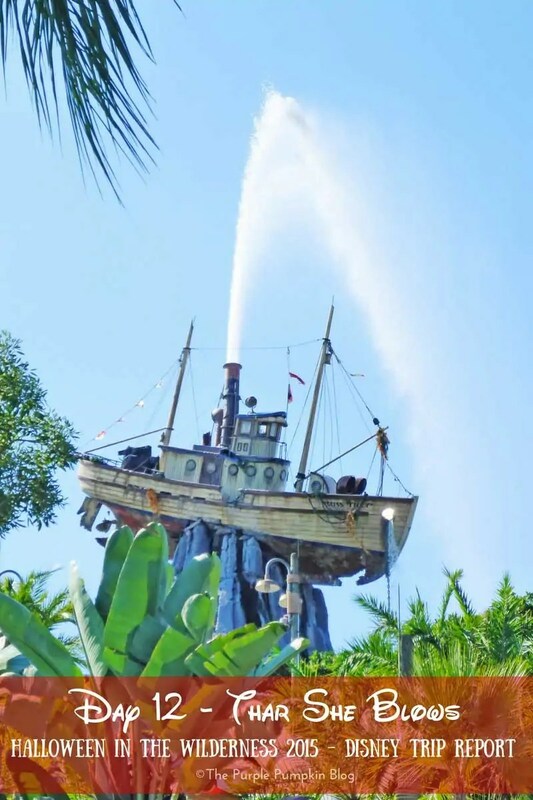 Pretty much everything that Disney Imagineers create has a back story, which I think is really cool: A furious storm once roared across the sea, catching everything in its path and sweeping and dumping them at Typhoon Lagoon! You definitely get that feeling, from the shipwrecked Miss Tilly at the highest peak, to all the other little shipwrecked items around the park. And of course, lots of lush greenery, plants and flowers. For lunch, we bought some food from Typhoon Tilly’s, which is a counter service/quick service restaurant. As such we used our Disney Dining Plan to pay for it. During the day it looks like we also bought some popcorn and a pretzel with snack credits. When it comes to the Deluxe Disney Dining Plan at a quick-service restaurant you are entitled to one entrée, one dessert and one non-alcoholic beverage for one credit per person. We spent a hilarious time in the surf pool, trying to jump over the waves, trying to jump into the waves, and trying to stay afloat as they came crashing towards us. One did swipe me right off my feet, which made me laugh non-stop. I still had my camera in my hand, luckily my sunglasses were on a stringy thing to keep them on my face, and I only got a few scrapes from the rough floor. A life guard did come over and check if I was okay, as I wasn’t getting up, but to be honest, I was laughing so much at myself that I couldn’t move properly. The waves are HUGE, so be mindful of this with smaller children, and if a non-swimmer, or not a good swimmer – even at the edges of the pool, they can knock you over if you’re not careful. Fortunately I am a very strong swimmer so wasn’t worried at all for myself. You do get warnings when the big waves are going to come, and those that are daring (and stupid!) enough, swim towards where they start – including me. Lots of fun though! We stayed pretty much till closing time, before packing up and going back home. I don’t bother getting re-dressed at water parks; I just dry myself off, and throw a beach dress on! Back at our hotel room, we had a proper shower, and got dressed for our dinner reservation at Jiko – The Cooking Place, at Animal Kingdom Lodge. Before we went downstairs to the restaurant, we popped into the resort store. They sell such cool items here, and it was the first time I think, that we’d seen Christmas snacks for sale. I think I bought a few pins, and we then went to Jiko to check in for our reservation. We have dined at Jiko before, and it’s one of our favourite signature restaurants. It’s got a lovely atmosphere, and the food is delicious. Signature restaurants always serve a free basket of bread (and you can ask for top ups) so it’s a way to save on appetizers if you want! Often, for appetizers we share them between us, and that’s what we did here. I couldn’t tell you what dips came with the breads, as the server reeled them off so fast, I didn’t get a chance to make a note of them! I also ordered a side dish, or “Enhancement” from the menu. This isn’t included in the dining plan, and we paid for this out of pocket. We were also given a plate of small cakes – free – I don’t know the name of them, but they were a bit like coconut macaroons. The desserts, as you can, were just so pretty to look at, and were delicious in eating. Liam had the same dessert last year, and enjoyed it just as much. Steve, again, definitely made the best choice! We paid our bill, and drove back to Wilderness Lodge. Every time we head back “home” we would always hang out in the lobby for a while before going up into our room, because the lobby here is just stunning!